Tessive has presented Time Shaper, a new approach to make smooth footage at a standard frame rate by using high-frame-rate (HFR) source footage. Their approach solves the “judder” problems of rolling square wave shutters. It also gives the cinematographer total control over footage speeds even when time-ramping. Time Shaper Introduction from Tessive on Vimeo. With a film camera under-cranking or over-cranking the frame rate was a simple matter of, well, just changing the crank rate. Digital cameras don’t have that luxury and even if they could then exposure would still be a nightmare that would have to be controlled during the ramp. Unlike some other software solutions, Tessive’s Time Shaper doesn’t use an algorithm to create frames which can distort the image but rather computes real speed ramps using the raw data contained in the HFR source material. Time Shaper Demonstration from Tessive on Vimeo. The raw clips from the camera also remain in their original format with its full color and metadata intact so it doesn’t toss out any frames and is a non-destructive low-risk approach. What’s really cool is because you’re shooting with a 360° shutter at 120 FPS (or higher) all the data is used and there’s even a net gain of illumination. 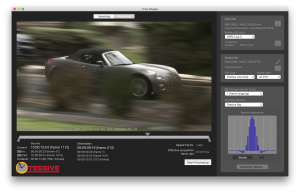 Time Shaper works with ProRes, H.264, ARRIRAW, and ACES (EXR) file formats and runs on Mac OS X 10.9 Mavericks or higher. The system retails for $195 as is available for a 31-day fully functional trial license on their site here.